Tech Savvy Seniors students, Margaret (left) and Usuff (right) join in the fun of learning how to use their phones in the 'Android Smartphones for Photography' class. Tutor, David Vasey is 2nd from the right. This year is the 60th Anniversary of the NSW Seniors Festival. It’s a time where we celebrate the contribution our seniors have made to the community and is an encouragement for them to continue to be active, social and healthy. Macquarie Community College strongly supports seniors in the community and has been providing affordable learning programs for seniors through the Tech Savvy Seniors program since 2013. 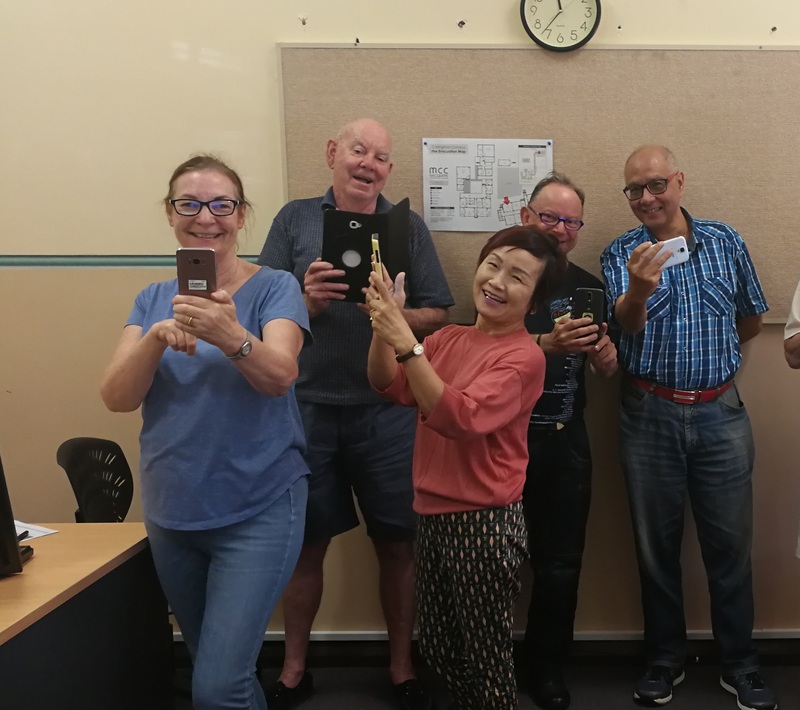 Funded in partnership between the NSW Government and Telstra, participants must be over 60 years old and can attend our Tech Savvy Seniors classes for only $10! Each term, we hold several classes specialising in teaching our seniors how to use the latest technology - Skype, cloud computing, iPhones and Android phones, iPads and tablets, apps, streaming music, social media and more! Usuff, a Tech Savvy Seniors student, explains why he keeps coming back again and again to the classes. ’I already knew a bit about technology from playing around with my smartphone and learning from friends, but that only got me so far. After coming to the Tech Savvy classes, I got so much more insight into how I could use my Samsung Galaxy phone that I would never have been able to find out for myself'. He explains further, ‘coming to the classes has taken away the fear factor’. Previously, he would get stressed when confronted with icons on his screen, but Tech Savvy Seniors tutor, David Vasey (also a senior himself), patiently showed him the significance of the icons and how they could be managed by simply dragging and dropping to other places on the phone screen. It turned out to be so simple! Usuff especially likes how the class is only for people over 60 and class sizes are kept small. It makes it less scary and intimidating to ask questions. The class can move at a pace that matches the ability of each student, whilst also receiving one on one teaching so that no one is ever left behind. Fellow student Margaret, explains how she felt empowered after the class to be able to confidently use her own phone, rather than always watching her friends use it. She is especially excited to meet up with her friends to show them the new panorama feature she discovered and practised in class! More courses will be scheduled in the upcoming months. Join the waiting list for future Tech Savvy Seniors courses by emailing info@macquarie.nsw.edu.au or calling 1300 845 888.